There is no blade... it is a rectangular prism with a rounded point, not even a spike of a weapon. You could hardly call this thing a weapon, which is shocking to me since the less expensive "old man cane" has a very sharp and high quality blade on it. I just got it and I am heart broken... I would have spent the money happily on cane sword with a flashy, elegant look like this one... but sadly there is no sword to be found here. The Cold Steel Classic sword cane does feature a blade, although it is not a traditional sword blade in that it is not flat and edged like the Cold Steel Heavy Duty Sword Cane's blade. This item's blade is four sided without any edges and tapers into a wicked point. It is designed primary for piercing and stabbing, but can also be used in a slashing way as an impact weapon. The sleek and stylish design of the cane does not allow for the room needed to house a more traditional sword blade, so Cold Steel opted to use a blade more comparable to a fencing foil or rapier. This blade could be an effective self defense measure against an animal or assailant. This weapon is exceptional. It's strength seems to be slightly over played as I have bent the tip. Also the weight is off balance, the center of balance (on my cane) seems to be an inch or two further down the blade than the handle is. But with training and proper care this is a very good weapon to have at hand. Very quick delivery, as usual - thanx again, TS. My Dad had a couple of cheapie sword canes back in the day, and THANK GOD he never had to actually use one of them for serious; cheap steel blades that bent and wouldn't hold an edge, cheap wood sheaths that split and cracked way too easily - and they weren't very good as canes either. Were he still here, THIS is the sword cane I would supply him with! It is solid, well-made, and well balanced. Comfortable in the hand and not too heavy, it's an excellent walking stick. Spring tempered sword blade is rectangular in cross section and tapers to a VERY POINTY business end; it is all thrust and no cut - Cold Steel demo video shows it being wielded rapier fashion. I like the heck out of it. Stainless steel head looks like it would make a really spiffy mace, but RESIST THE TEMPTATION to use it as such - bad guy grabs it, HE'S GOT YOUR SWORD! Getting skewered with your own sword is held to be a BAD THING in defensive fighting. When you unsheath the sword, twist the head CLOCKWISE ONLY as you unsheath it! That tightens the head on the shaft of the sword. If you twist it counterclockwise, you'll loosen the head on the shaft of the sword, and this is BAD for a number of reasons. Reason No. 1: Loose grip on any weapon NEVER GOOD. Sword falling off the grip and clattering at your feet; or worse - grip coming off in your hand while the shaft of the sword remains in the sheath considered HIGHLY COUNTERPRODUCTIVE in self defense situation. Reason No. 2: The carbon fiber sheath has a 12" rubber liner or buffer that keeps the shaft of the blade from rattling in the sheath. If the blade unscrews sufficiently, if will catch in the liner, tear it, and foul the blade, making it darn near impossible to unsheath in a hurry. Point of the blade will continually catch in the torn liner, damaging it further. Did manage to finally extract the damaged liner with a coat hanger and lots of colorful language, and Roger at Cold Steel in AZ sent me a new liner gratis. SO - I'd highly recommend that you put a couple of drops of BLUE Loc-Tite on the threads of the head very first thing, and eliminate all kinds of potential unhappiness. Also, be circumspect when you sheath the blade. You don't have to baby it, but don't just slam it in there, either. That said, you do have to work at it to catch the point in the liner, but why look for trouble? This is an excellent piece of gear; if Cold Steel offered this with a sterling silver head, it would be the perfect gentleman's accoutrement. Just got my sword cane. An exquisite weapon. I feel safer already. The blade is longer than I expected. The point is very sharp. The balance in hand is good, the scabbard is very sturdy and the tip provides good traction. A very light oiling [WD-40] will make the blade easier to remove. The fit is tight, so a little working is necessary to loosen things up a bit. The vacuum that is created when the blade is withdrawn requires a little practice to make removal easy. To be honest, when I first got this, i didn't find it all that impressive. But that was at first glimpse, when I had about 5 minutes to get it out of the box before I had to rush back to work. After getting back home, I took a while to study it. The fiberglass shaft is beautifully made, and very strong. The blade itself was longer than I expected, and the point was VERY sharp. 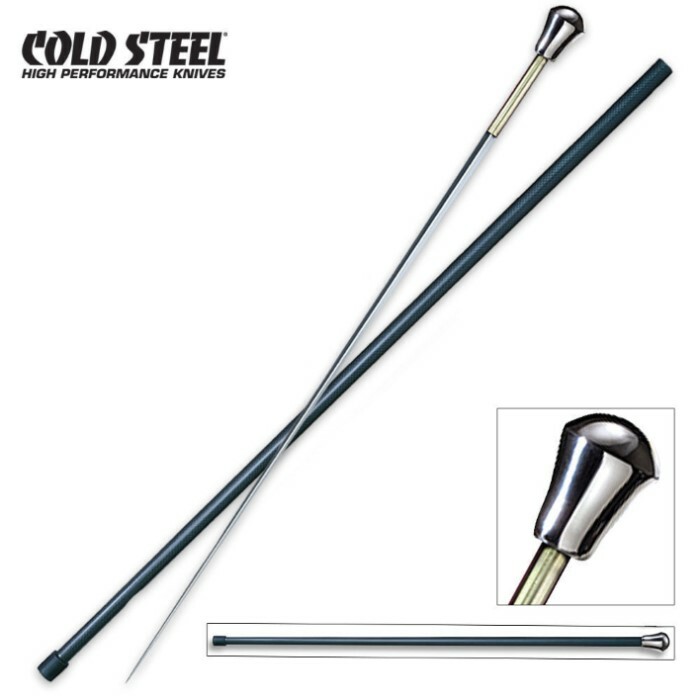 What I like most about cold steels sword canes compaired to other sword canes is the quality of the product. Unlike most other sword canes, the blade doesn't jingle around inside the shaft, and for someone like me who likes to take this thing everywhere, that's very important. Having said all that, after having taken the time to appreciate this piece, I can't put it down. I bring it with me wherever I go. Thank you Cold Steel, and DEFINITELY thank you true swords for supplying this product at the cheapest price anywhere!